This article originally appeared in the Dorset County Hospital Staff Magazine, published in the summer of 2014. 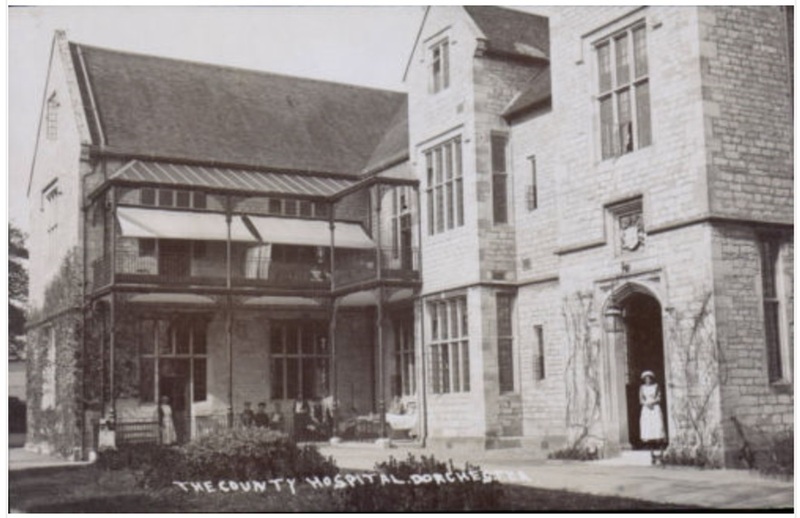 Working in a modern hospital environment, you could easily forget Dorset County Hospital has a long history. In fact, next year will see its 175th anniversary. Intended for the working poor, the hospital’s origins lie in a series of public meetings in 1838-39 called by local MPs and businessmen. This was the age of Victorian paternalism – the founders wanted to create “an enduring principle of gratitude and thankfulness to the superior classes from the labouring community”. The foundation stone for the hospital was laid in May 1840, in ‘West Back Street’ in central Dorchester, on land donated by wealthy banker Robert Williams (after whom Williams Avenue is named). The original building – in what is now Somerleigh Road – has become an apartment block. The building and running of the hospital were paid for by subscriptions and donations, enabling it to remain an independent charity until it was taken over by the National Health Service in 1948. A one guinea subscriber could nominate one in-patient or three out-patients for treatment. This meant that a would-be patient needed to know a subscriber, except for accident cases, when the hospital gave emergency treatment. The workless and friendless, without a subscriber to nominate them, had to rely on overcrowded workhouse infirmaries. Initially there were just 20 beds. Only 220 in-patients, and twice that number of out-patients, were treated in the first eighteen months. The paid staff were a newly-qualified house surgeon, a matron, and a small handful of nurses and domestic servants. The nurses were untrained, the only requirement being “respectability” (in 1851, there were just four nurses – three in their sixties!). Medical expertise was provided by local private doctors on a consulting basis. They undertook this unpaid work for its prestige, and for the opportunity to build their practice through contact with wealthy patrons. Because the patients were receiving charity, they had to submit to medical experiments. In January 1848, Eliza Satchell, aged 38, from Langton Herring, had a 2¼lb tumour removed under chloroform, just three months after its medical use was first discovered. Some medical practice was unexpected: in 1843 the hospital spent £73 on “beer, porter, wine and spirits” to treat patients. By 1862, alcohol for patients represented seven per cent of the hospital’s expenditure. Over time access to the hospital widened: employers were encouraged to subscribe for their workers, and private fee-paying patients were taken. During the Great War, the hospital received nearly 2,000 wounded servicemen, plus 25 German soldiers from the prisoner of war camp at Poundbury. By the eve of the NHS, the hospital was treating 2,100 new in-patients and 4,800 new out-patients a year. That ever-growing demand made the voluntary model unsustainable, and state funding essential. In 1948, assets then worth £100,000 – built up over 108 years of charitable giving – were transferred to the NHS. To find out more about the hospital’s pre-NHS history, see my website www.historydch.com, and look out for information about how you can help celebrate the hospital’s 175th anniversary next year.